Dumpster Patrol | Pro Chem, Inc. This specially formulated dry product releases a fresh cherry fragrance and absorbs foul odors. DUMPSTER PATROL is made with no hazardous materials. By using the natural base of ground corncobs, this product is completely safe and provides significant benefits. Corncob is very absorbent, so it tends to hold more of the active odor killers than other bases. Also, corncob is a biodegradable material, so when it finally reaches the dump, it does not add to waste but degrades into the soil. DUMPSTER PATROL provides the combination you need to keep your trash exactly where you want it – unnoticed. 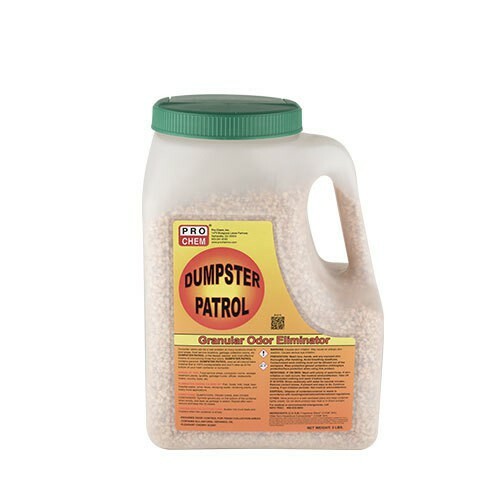 For just a few pennies per day, DUMPSTER PATROL will assist in eliminating your odor problems. Dumpsters, trash cans, and other containers: Sprinkle generously on the bottom of the container when empty, and layer as garbage is added. Repeat each service and keep the lid closed. Trucks and collection cans: Scatter into truck beds and hoppers when the container is empty.